At Gretch's urging, I decided to proceed with the other project as well. I wanted to do something a little brighter than the other one. 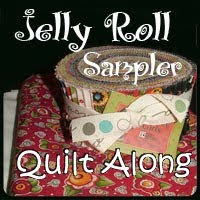 The jelly roll I chose is Nature's Chorus.....funny i didn't hear any singing! There is not as much contrast as in her first block (Gretch) that is). I hope it will be okay in the end. So much nature that after I finished the block, I needed to rest. Besides my 2 favorite Tues shows were repeats-luv those NCIS men! 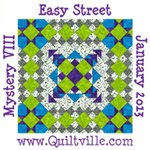 Block 3-Jelly Roll Sampler- "Gretchen's Fault"
by Moose on the Porch quilts. It goes together very quickly-just as the directions said. I decided that I should try to accomplish something this weekend. This is the Moda Bake Shop pattern that I started a couple of weeks ago. I started with the Bar Harbor line and then added from some of their previous lines. 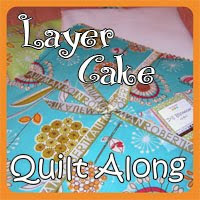 Sandy at Patchwork Cottage helped me to calm it down a little by using same color lattice. 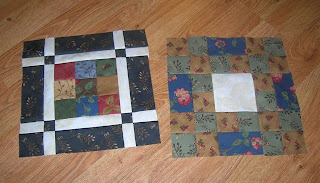 I am going to use beige cornerstones, lattice and inner border are the same fabric (redish) and outer border using large Bar Harbor flowers. Love those flowers. Wild Willie checking out my work. I think I got a 2 paws up! Gretch was busy this weekend with blocks as well. I REALLY need to work on that finishing kit instead of playing with new things. I needed some quality time with Alice. We had a good time today. 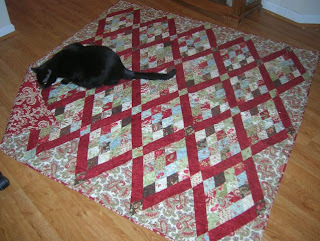 I had made some of those quilts awhile ago that take one yard of 3 different fabrics and end up with 3 quilt tops. I thought that these would make great floor quilts. Kris says that she enjoys being on the floor. 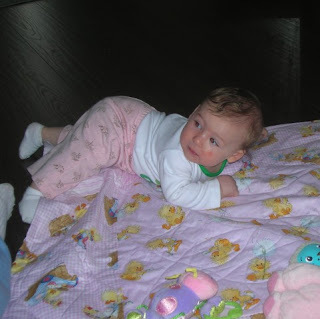 we watched her rolling over back and forth. Quiet but fun day. Since I have already made a quilt named "Gretchen Made Me Do It", I think I will be calling this project: "It's Gretchen's Fault". 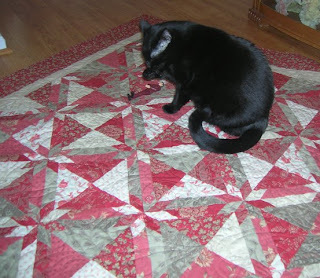 She blogged about a project that she found on Moose on the Porch Quilts. She KNEW that I would have to check it out. I have been pondering jelly roll choice on this bad boy. I do seem to have a few!! I decided that I would use the line called Looking Back by Brannock and Patek. My other started projects are currently stalled. 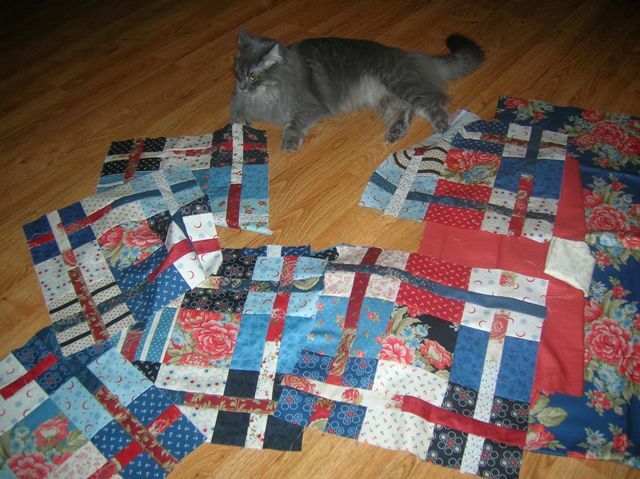 Thimbles Cheetos quilt is on hold until I recover the pieces I dropped on the way out the door last Saturday. And then there is the Moda Bake Shop project that I am using the Bar Harbor line. That makes three projects in the early stages. 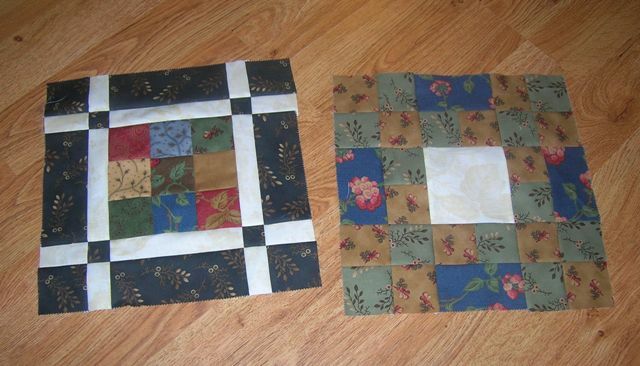 I have 2 quilt tops that need backings and one quilt that is being quilted. So what am I going to do right now? head for the couch!! I don't know why Karmen is calling me Dr. Frankenstina.....well okay-I kinda do. Yesterday after work I went looking for a bed for Moda Man. Do you know how hard it is to find something appropriate for such a discerning man? But I was successful. I got home and decided it was a little too feminine for him. 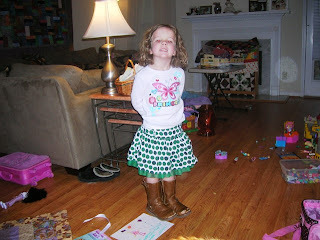 While he is in touch with his feminine side- this was a little over the top! 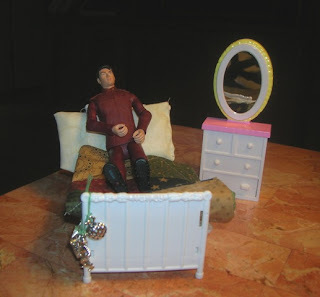 At any rate, I decided he did not need a canape bed. 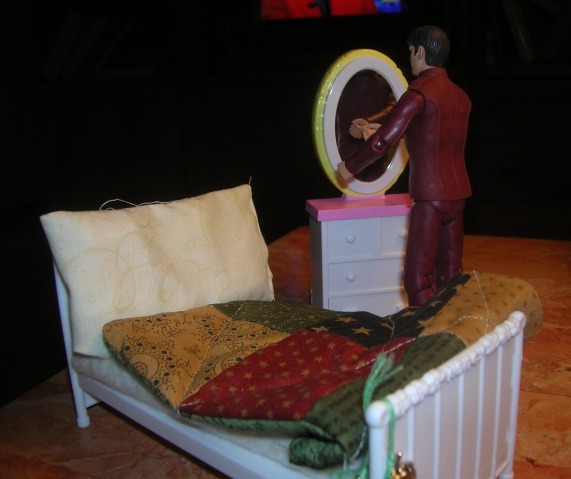 Then I went about making bedding for said bed. 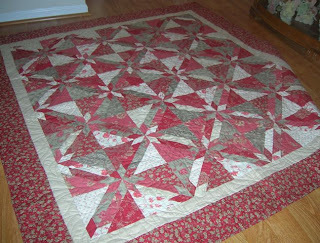 He now has a quilt-Brannock and Paddock. Quite understated but it will do. He also got a mirrored dresser in the deal. Nothing to put in it right now!! 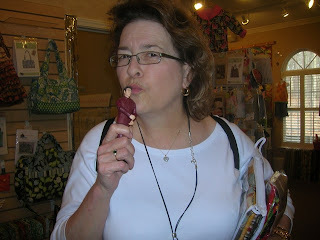 Thank you Kristie...now I need to make him clothes! She suggested a vest. Karmen suggested new line from Bradock et al. So now I have to get some of this! Louise thinks he should have a real bed! Okay maybe Barbie has one he can use because he won't fit into the Polly Pocket beds. She also went to a shop that he did not get to on the hop and she is giving him her charm for his vest. THE MAN IS DEVELOPING A LIFE OF HIS OWN!!!! And now I am starting to get worried! Relaxing on a rainy Sunday..
Moda Man has had a very busy couple of days. 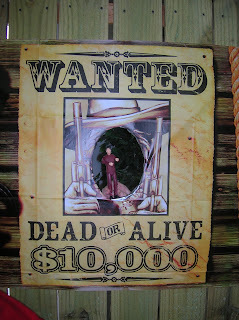 Yesterday he attended Thimbles and visited with some more of his friends. He made a repeat appearance at Patchwork Cottage. He planned to wait in the car but his presence was requested. Today he has just lounged around thinking about all the lovely ladies he met. He is quite the ladies man! 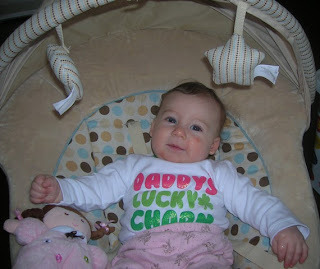 Kristie suggested a vest for him so that he can wear his charms. I will have to work on that sometime this week. I think he needs s Spring outfit. I wonder which Moda line would be the best? 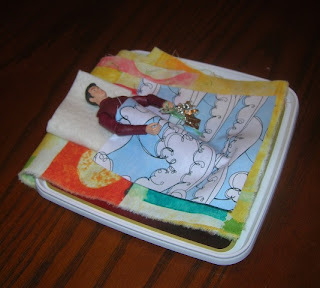 While he was napping I worked on the BOM from FQ Shop out of the Glace line. 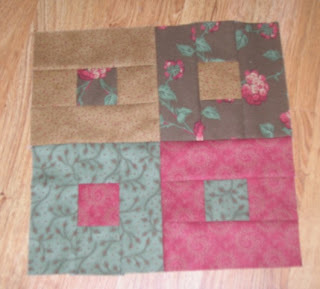 This block was a bear to do..too many teeny tiny pieces. I really need to start working on the finishing kit as there are only 2 more blocks to go. 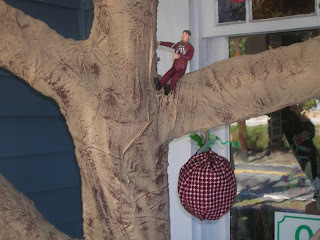 ...no, it's only the Moda Man checking the apple tree at Sweet Home> He visited with Melisa and the gang and admired the quilt on loan from Moda. It was beautiful...won't be making that one...8 million appliqued leaves on that bad boy. Pretty to look at though. He also spent a few more minutes with Pat before she left. Then he decided to visit with Mita at Patchwork Cottage. She was happy with him as her shipment of Bar Harbor had arrived. What a beautiful line...love those big flowers. My plan for that fabbie is not working out. I need to do some modifications on it. Tomorrow is Thimbles....just plain having fun...can't wait! Was that Moda Man out and about in Atlanta? Moda Man took to the road to check out some of the shops participating in Shop Hop. 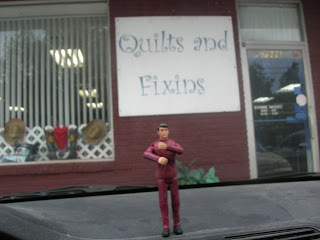 Here he is at A Scarlet Thread south of the city. He ran into Pat who had an arm full of Moda. He was a happy camper. 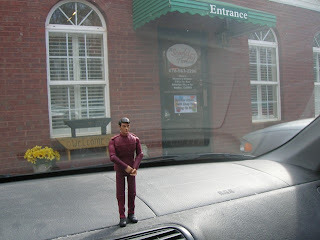 Then he headed over to Jonesboro to see what was happening at the corral. He was spotted there but don't you believe everything you see. He is an honest man! 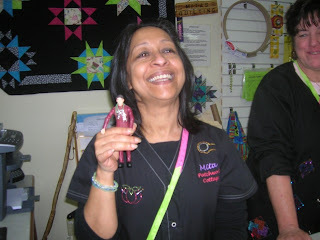 Moda Man has taken time away from fooling around with the Polly Pocket girls to check out Reenuzit quilt. This was the Thimbles project for January. I took all the pieces with me to the retreat at Elijay. I really do love this fabric line from the French General (by Moda). Henry has also checked this bad boy out. He insisted on sitting on it on my lap as I was sewing on the binding. Finished just in time..this weekend is a Thimbles weekend. Also it is Shop Hop. I may try to do a couple of shops but am not interested in going to all of them. the day after the night before.. I see Moda Man is back playing with the girls...I guess the girls take after their grandmother!! He was in my sewing basket and they found him. Henry and Willie are playing with ZuuZuu pets. I will probably have to move furniture to get them out. Emma was up first and put every light on in the room to get Sarah to wake up and then took her picture 2 feet from her face. Don't mess with Emma. 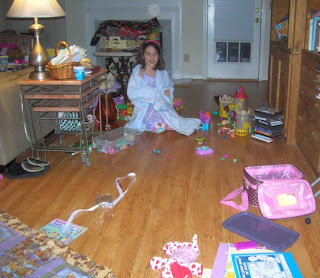 The living room....disaster...I have a perfectly good guest room but the girls insist on sleeping on the couch. My slipper seems to be missing. I hope to find them later. 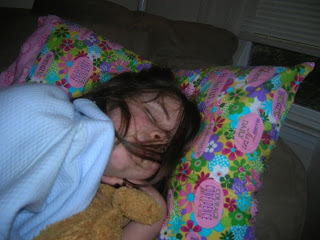 Sarah and Emma are here for a sleepover while mom and dad get rowdy in Atlanta. I picked the girls up on the way back from Alpharetta. I made a stop at the J store to get some craft projects for the night. We had our Mickey Dee's picnic in the living room on the teddy bear quilt. We have lots of movies that we can watch and of course there are the toys. 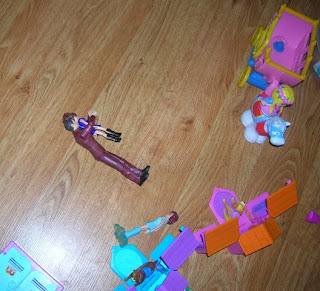 Polly Pockets galore. We have made cookies already and it is only 7:45. The craft projects are sligthly less than successful, although Sarah did a good job on a little bunny house. I am trying to keep a path in the living room so that we can walk but not having too much success at this point. I am so happy that it is Friday. 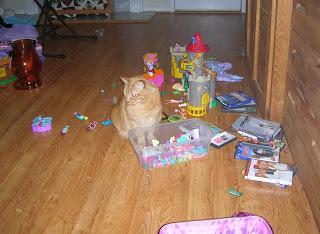 I am thinking we need a shorter work week because work is getting in the way of my play time! Sarah and Emma are coming for a sleepover tomorrow night. I need to think about something fun and different for them to do. Maybe something green for St. Patties Day. I think I will stop at Michael's on the way home. Also have to go over to Alpharetta in the morning to pick up my taxes. Hopefully it will be okay this year...never can tell!! I sure hope the weather here improves...and the bad weather coming in from Alabama moderates. Springtime in the South....always and adventure! Now...countdown to finish of the work week...seven hours-fifteen minutes!! Hello out ther in blogland. Henry here. I am the handsome boy pictured on Mom's blog. I just wanted to clarify that I am not Wild Willie. I am much more sedate than that crazy boy. I prefer to be aloof when approached by others. Mom calls me the undercovers boy. That is where I like to sleep (under the covers or quilts). It serves 2 purposes: I can escape from the little critter and I can stay warm. It has been a cold winter so I have spent lots of time under the covers. 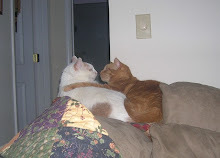 The other thing I enjoy doing is checking up on the other blogger cats. I always look forward to seeing the antics of Stella and her brothers. I decided I should try to complete something..anything..this weekend since I have UFOs all over the living room...kitchen, sewing room. 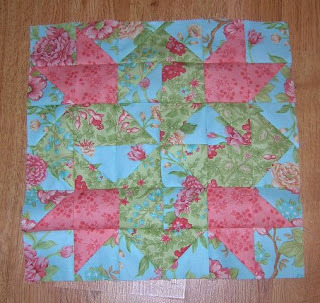 I put the rest of the outer border on Patches and Pinwheels. Swap buddies this finishes one very big quilt. Now it needs a backing. I am thinking a wide backing because it will need 3 widths of fabric. I put borders on Carolina Crossing and made a backing for it as well. I still need to figure out backing for Carolina Christmas. I made myself not start another project although it is sitting here tempting me. It is a Moda Bake Shop project and I am going to use the Bar Harbor line with additions from past lines of Prairie Paisley and some Wiscasatt. But for now I guess I should think about getting the work week started.. I finally finished up this quilt started ????? It was a Thimbles project from last summer. I changed the lattice color to the red. I had made a cutting error on the setting triangles and had to use the binding for that so I made the binding out of excess backing material. I am glad it is finished. I don't think I will make this one again since the construction was not my favorite. 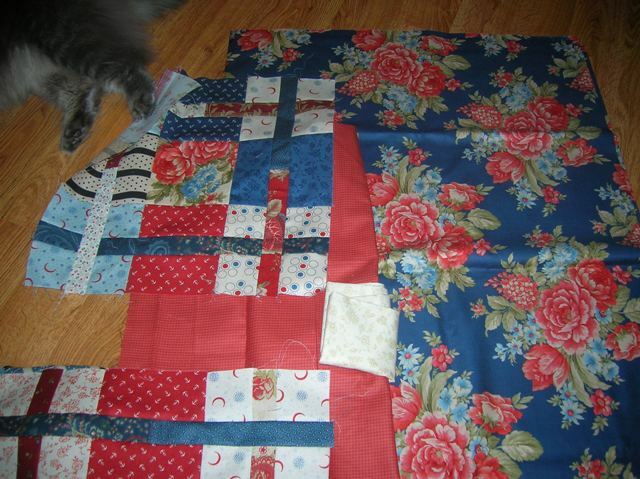 Looking around the living room, I see 3 almost completed quilt tops. What's up with that??? It looks like Bonnie Hunterland in the living room. Carolina Christmas is out because I am making a backing for it. I decided Carolina Crossing did need borders after seeing hers in person last weekend. Patches and Pinwheels is almost done-I need to finish sewing the outer border on two sides. And that is what is in the living room. We won't even think about the sewing room! Oh boy, oh boy, the big brown truck stopped and left me a package from Fat Quarter Shop. I have seen so many comments on this book by Kim Brackett and I just had to have it. 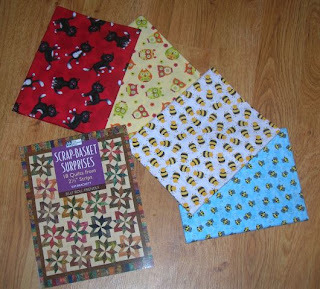 And since I was ordering, I got 2 pieces of bee fabric(upcoming quilt for Morris Brandon school raffle next year), a piece of owl fabric for Punky Loo and a cute kitty fab that I have no idea what I will do with it! Sewing evening was cancelled tonight due to the nasty white crud that has fallen out of the sky and made me very grumpy! Poor Gretchen is somewhere out there. She was supposed to fly home from DC today and flight was cancelled. She was headed for Minneapolis and then home. This winter has just gone on way too long, says she has the heat clicks on again. How can I buy fabric if I have to keep sending money to MX Energy? I am off to the couch to drool over my new book and plan some stuff!